Williamstown, situated on a peninsula eight kilometres south-west of Melbourne, is the oldest continuous settlement on the shores of Port Phillip. The design of the Williamstown Library is based on an understanding of Williamstown as a unique place within Melbourne, characterised by a strong sense of identity and community. It is contemplated not as a standalone building but as an integral part of its urban context. The site spans two distinct precincts: the historic Town Hall precinct to the west, and the retail precinct to the east. The design approach allows the library to act as a “bridge” between these two different urban environments. Williamstown’s maritime heritage is reflected in the building’s architectural features with the use of ply in the timber bridge as well as the curved form with wooden beams alluding to Williamstown’s history in boat building. The extensive use of wood and the translucent polycarbonate create a calm and airy feel to the library space. Fifty or so browsers, readers, researchers, students or PC users seem to have little impact on the overall sense of calm. The architects saw the library as two interlinked components. A softly curved translucent structure houses a double height reading room, whilst the ancillary spaces are within a rectilinear, bluestone wall. The bluestone is punctured by a series of deeply set openings acting as a threshold or filter between the cultural realm of the Town Hall precinct and the commercial areas to the east. A series of flexible community gathering spaces are created between the Town Hall and the library . A sheltered sun lit courtyard to the north opens off the UCAN library café and to the south generous timber step seats spill out onto the Town Hall forecourt providing an engaging and comfortable meeting place. 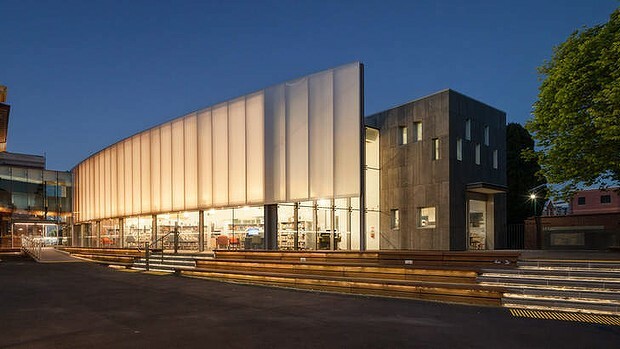 The Williamstown Library incorporates strong environmentally sustainable design (ESD) goals with solutions integrated into the building fabric. This was achieved through innovative design of the building envelope, thoughtful configuration and zoning of spaces, and the integration of a multi-stage hybrid HVAC system designed to balance occupant comfort with energy efficiency. The HVAC system incorporated into this building is designed to work seamlessly with the spaces and architecture of the building to minimise energy consumption throughout the year. A sub-floor labyrinth covers the entire footprint of the building. This labyrinth takes in outdoor air below deck level and allows it to filter into the occupied spaces providing passive cooling for much of the year. High level extract vents in the main reading room combined with automated windows in the building spine serve to draw air from the plenum through the occupied spaces thereby providing natural cooling and ventilation to all areas within the building. As the temperature rises, dampers in the sub-floor plenum close and a VRV system utilises the sub-floor space for distribution of conditioned air into the building. During cooler months when natural ventilation is not possible, heating is achieved through the use of hydronic in slab heating in the main reading room and supplementary air based heating in the ancillary spaces. The energy efficient hydronic system warms the indoor air for the most part and is boosted when required by the VRV system. Energy efficient lighting, daylight and motion sensors have been incorporated into spaces and an automated night purge system allows for high level extract. A 40,000 litre water tank is located below the main deck and harvests water from the library and part of the town hall roof for re-use in the building. The building features recycled timber and steel composite structural columns, natural Victorian bluestone and low VOC materials and finishes throughout. The Williamstown Library combines innovative, elegant design with smart sustainable design solutions to create a library that will serve the community now and into the future. 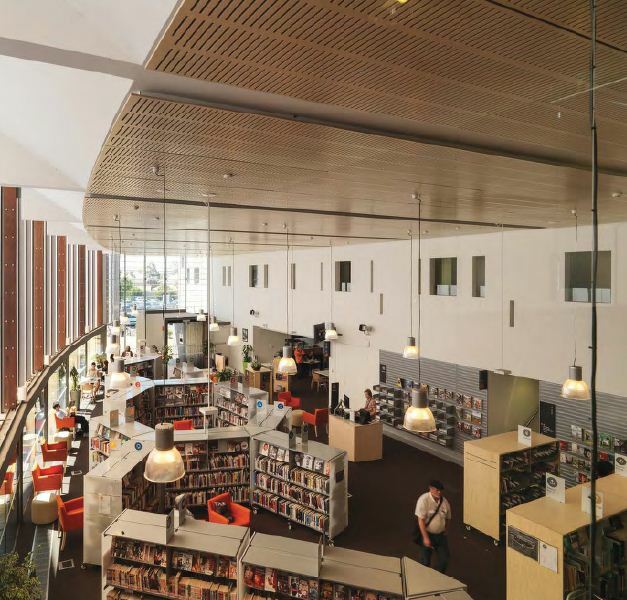 This modern, two storey library has brought new life to Williamstown’s historic arts and civic precinct with the library collection interspersed with attractive reading spaces and state of the art technology incorporated throughout. There are self serve RFID issue and return terminals, automated book returns, iPads for casual browsing, PCs and wireless internet and a gaming zone. The bookshop inspired layout invites the reader to browse the collections, then to sit to read and linger in the nearby chairs. Williamstown Library is a vibrant meeting place for the local community where visits regularly outstrip loans. The space is flexible to meet the needs of an array of different types of programming. 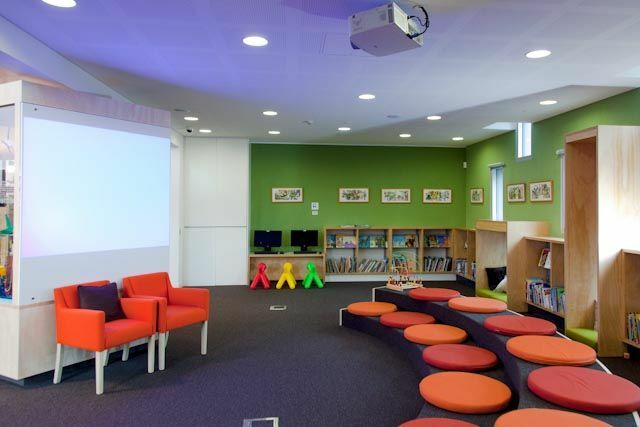 The library runs the usual programs for children such as Rhymetime and Storytime in the colourful children’s area. However, the flexibility of the layout is showcased when larger author events are achieved by wheeling the collection into storage to allow half of the floor space to be set with 150-200 seats. Recent author events included Matthew Reilly and local favourite Andy Griffiths. While relaxing on the outdoor deck you can plug into recharge your favourite device or enjoy acoustic sets from local musicians as part of the Music on the Deck program. Local community group, Transitions, are supported to meet monthly on the deck to exchange garden produce at ‘fruit and vegetable swaps’ and regular book sales run by the Friends of the Library group provide funds for the library’s programs and services. The deck creates a vibrant and active urban space and the “bridge” between the two buildings. Regular cultural events on the Town Hall calendar such as the Williamstown Literary Festival, the Rotary Art Show, Mobil Night at the Opera and the Antique and Vintage Fashion show spill out from the ballroom to enjoy coffee and drinks at interval. The first floor Gallery hosts art exhibits from local art clubs, schools and kindergartens, and has hosted several national touring exhibitions, bringing high calibre exhibits to the community’s backyard. When not in use for exhibitions, the gallery is well used by students at the shared study tables. Views of Melbourne’s city skyline can also be enjoyed from the Gallery. For those wishing a quieter library experience, the library offers an acoustically treated study room, with peaceful views to the Town Hall and golden elm. The library experience is enhanced by the aroma of freshly baked muffins and espresso. Library members can enjoy a coffee or bite to eat at the UCAN Cafe. UCAN Cafe is a social enterprise supported as part of an award winning partnership with Hobsons Bay City council, paying award wage employment and training for young people with disability. This innovative enterprise has provided local youth with over 20,000 hours of employment. The history of Hobsons Bay is showcased in the dedicated Heritage Room. The room is a haven for family history buffs, curious visitors, and serious researchers and boasts an impressive collection of local history primary and secondary source materials. Best practice accessibility features include three fully accessible bathrooms, including accessible shower facilities and a hydraulic change table. The integrated ramp entrances and the lift provided in the linkway provides accessible entry to the Town Hall for the first time in almost 100 years. I have visited this library and it is truly world class. Worth putting on the public libraries of the world bucket list.